While principals are not required to approve every chapter activity, the constitution grants them authority to do so, if needed. Consider these tips for helping your school get the most out of its NJHS affiliation. Appoint a competent and caring adviser. Support him or her by providing professional development opportunities when feasible. Consider these matters when choosing an adviser. Help the faculty council craft and distribute selection procedures. Each chapter’s selection procedures must be publicly available to students, parents, and faculty, and a well-written procedure is an excellent way to promote the chapter within your school. Familiarize yourself with the NJHS Constitution and NJHS Handbook. Knowing NJHS policies will enable you to better support your NJHS chapter and answer parent and student inquiries about the program. Evaluate and assess your chapter’s procedures and activities. 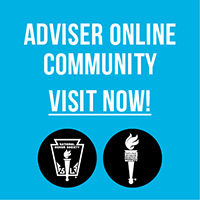 Meet with your chapter adviser and faculty council at least once a year to learn about chapter activities and have an opportunity to share your insights. Maintain active affiliation with the national office. You’ll receive renewal information in the spring. Be sure to renew prior to June 30 to ensure uninterrupted services.